Can I Remove a Post From a 17′ Beam? 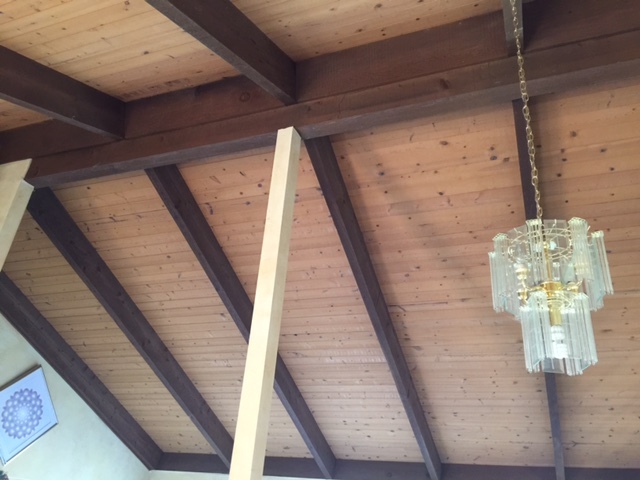 I have a header roof beam in my living room that measures 5″ by 12″ (Doug Fir as far as I can tell) and currently spans 16’8″ with a post in the middle. I would like to remove the post but can’t figure out if the beam is sufficient for the span. of nearly 17 feet. I don’t know the length of the joists, but the room is 15’8″ wide on one side. Hello Anodea, thank you for the question. Unfortunately, it is quite difficult to give either a yes or a no to this question, as there are so many variables. Geography (especially snow loads), roof pitch, grade of lumber, volume of mortises, etc. all play a role in determining the structural capacity of the ridge. However, we use Doug Fir quite a lot in our designs and I ran a few numbers. Using a tributary width of the 15’8″ (assuming the ridge is in the middle), a duration factor of 1.0, and that the ridge is indeed #1 Doug Fir, the maximum allowable loading is 370 lbs/ft. A typical roof dead load is around 15 lbs/sqft, and results in 235 lbs/ft when multiplied by the same tributary width. Either roof live loads (typ. 20 psf) or snow loads will also need to be accounted for, which will probably exceed the dead loading. Either way, my inclination is to say that the post is there for a reason. I would recommend contacting a local P.E. or S.E. who can come out and inspect the site and determine some of the unknowns mentioned above – they could fine tune their calculations and could find that it could be structurally sound.